It wasn’t a snap decision. After two years on the sidelines, BTIG’s Rich Greenfield upgraded shares of social media company Snap to a buy rating Thursday. The stock surged more than 12 percent on Greenfield’s call that the name can reach $15 based on advertising growth. Snap has more than doubled in 2019, gaining nearly 105 percent. But the move followed what was a steep slide in the fourth quarter, and the shares are still roughly 38 percent from their 52-week high last March. The stock has undoubtedly been on a tear, but two market watchers said to be very careful here. He noted that if the stock could break the resistance and close above $12, tail wind momentum could lift it to $14 – $17. In an effort to attract new users Snap has undergone a series of design changes, among other things, but growing competition from Facebook and Twitter as well as a number of high-level executive departures have continued to plague the stock over the last year. 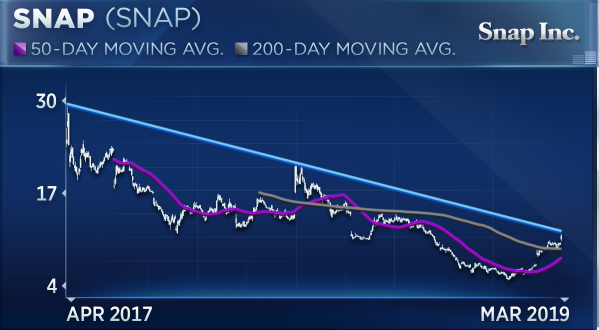 Strategic Wealth Partners’ Mark Tepper said he wouldn’t be a buyer of Snap until the company can prove it can appeal to a broader user base. He said that it has a “cool product” and that it’s the “most preferred social networking program among teenagers,” but the problem, according to Tepper, is that teenagers are not the ones with money to spend. This means the platform is less valuable from an advertising standpoint. The stock would be “intriguing” at $6, Tepper said, but for the time being, and after the surge higher, he said it’s a tough name to get behind.